From straight out of the first wave of bonafide punk rock comes this Boston gem. 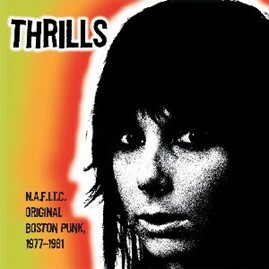 Thrills were part of the Real Kids/DMZ/Cars/Nervous Eaters/LaPeste school of bash-it-out and make 'em dance school of driving rock and roll. Like a demented cross between the sweet Spector girl-groups and the faster-than-Ramones tempos of a Black Flag, Thrills were, as their heroes the New York Dolls would say, too much too soon. This collection features their only single, plus demos plus live cuts that no punk completist can or should live without! Includes guitarist/writer/talk show host Johnny Angel on guitar and Merle Allin on bass!